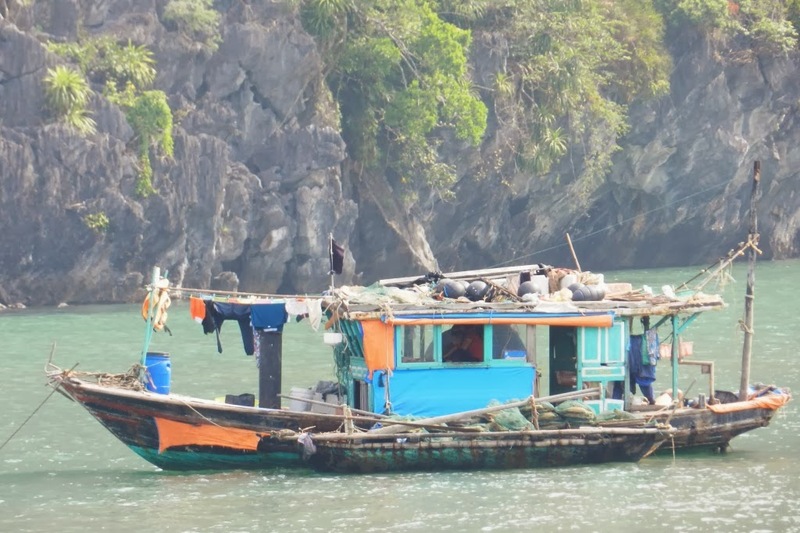 After a very enjoyable two and a half days on Halong Bay, (and four hour drive) we returned to Hanoi to experience more of the city. We braved the streets again, still unaware of the correct street-crossing technique, but managed to survive an evening of shopping and sightseeing. We snacked on a few small pastries that we purchased from the basket of a woman on the street (the French influence can definitely be seen in the bakery business), but needed something more substantial. So we found a nice little cafe adjacent to the Hoan Kiem lake where we enjoyed a mix of local food and a pizza (for the kids), as well as free wifi to catch up on email and to set my fantasy football roster. The best part of this little place was the view of the very busy street corner where a constant flow of people, cars and mopeds sped by. 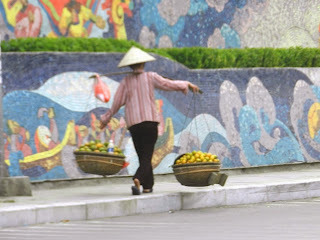 The next morning, our final full day in Hanoi, we scheduled a tour based on recommendations from the hotel staff. We met our guide, "Johnny", and headed out to explore the city. 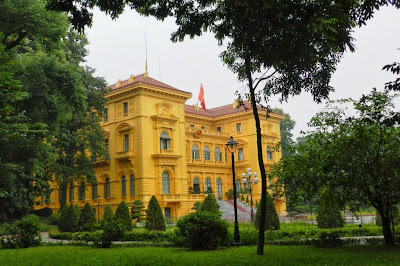 We made several stops along the way - the Ho Chi Minh Mausoleum, Presidential Palace, Ho Chi Minh's residence, the Military Museum ("Victory Museum") and the Vietnam Museum of Ethnology. 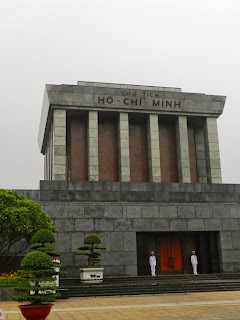 The Mausoleum, Presidential Palace and Ho Chi Minh's residence were all within walking distance of one another in and around the Ba Dinh Square. 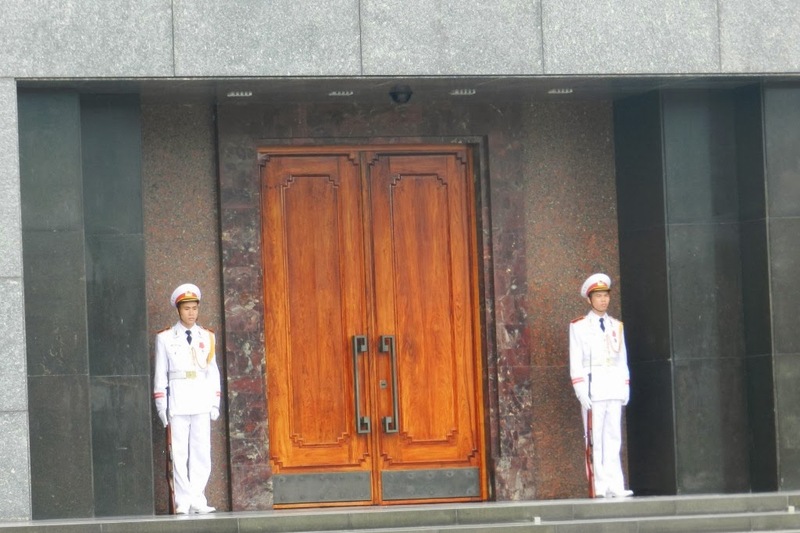 One thing that was abundantly clear during this portion of our tour was the complete admiration, respect and love of Ho Chi Minh by the public... or at least that's the story that's portrayed. The Ho Chi Minh Mausoleum, built in 1973 and inspired by Vladimir Lenin's mausoleum in Moscow, displays the embalmed remains of the former President of Vietnam. The granite building is massive, and is constantly under the watch of an Honor Guard. 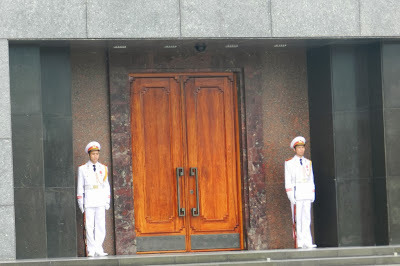 It was unfortunately closed during the time of our visit - apparently the embalmed remains of Ho Chi Minh require some freshening up from time to time, so we didn't have the opportunity to view the inside. However, from what I understand, there are some very specific rules regarding dress and behavior inside. For example, legs must be covered (no shorts or miniskirts) and visitors must be silent, walk in two lines, keep hands out of their pockets, and not cross their arms. Just some tips to consider if you are visiting yourself. 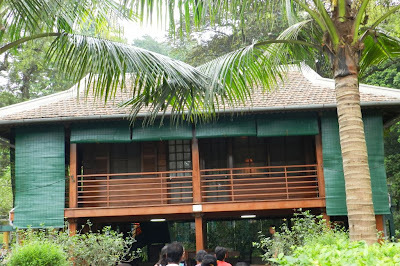 Instead, Ho Chi Minh lived in a very simple stilted home nearby. Ho Chi Minh's residence is raised on stilts, and has only two smalls rooms. It's said that he liked living in this home because it reminded him of the homes in which he took refuge when he was a revolutionary. 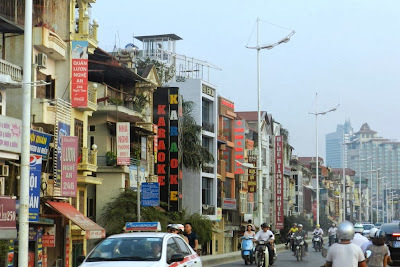 Though designed to mimic the stilted homes of common Hanoi residents, from what we could see, it was significantly higher quality and more polished than anything else we saw in the city. 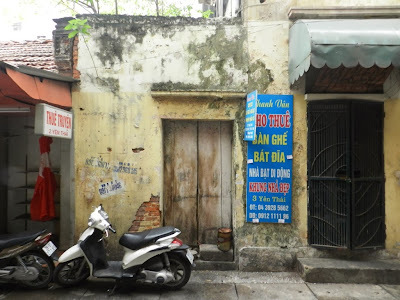 Oh - and it had a bomb shelter immediately next door - which was unique to homes in Hanoi. As we walked back through the botanic gardens and pomelo tree-lined paths that surround the Presidential Palace grounds, Johnny shared more perspectives about Ho Chi Minh. Again, his distaste for the French was palpable, dwarfed only by his respect and love for Ho Chi Minh. Several of his comments clearly demonstrated the strength of propaganda in Vietnam, for example, he was sure that the only possible way for the Vietnamese to push out the French was to follow Communist ideals and Communist rule. 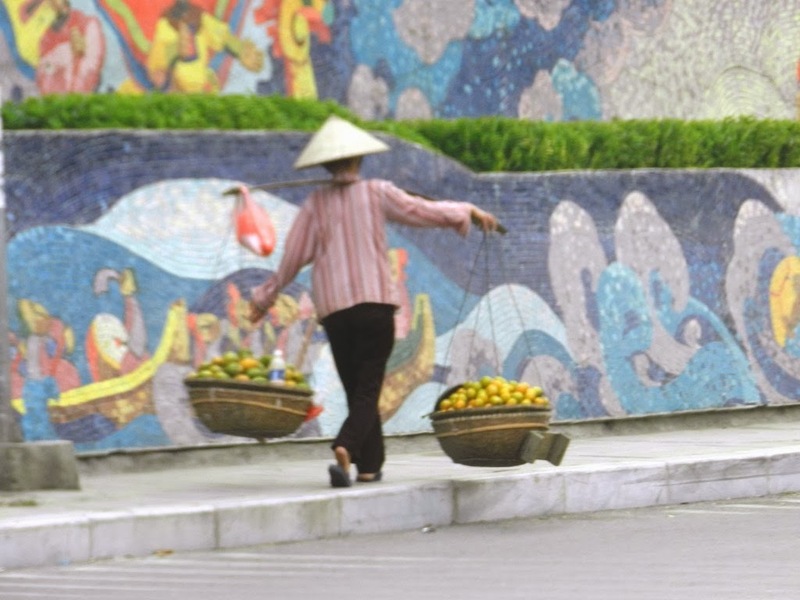 He later described how the massive grounds of the Presidential Palace were used by Ho Chi Minh to provide fruit and fish to the local population. 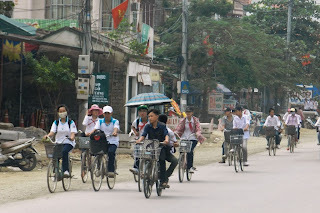 My favorite, perhaps, was his comment stating that locals wore face masks as they walk and ride on mopeds throughout the city to avoid getting a tan...not because there is significant pollution in the city. OK, then. 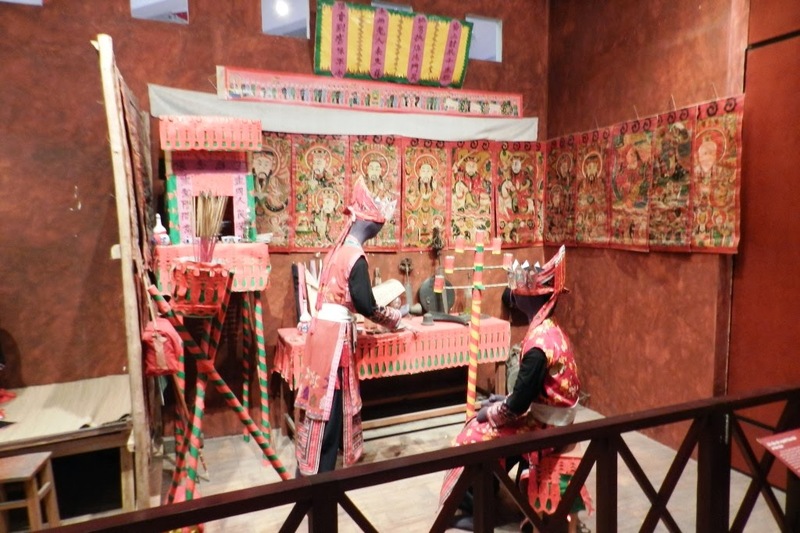 The next stop on our tour was The Museum of Ethnology. There are 54 ethnic groups who call Vietnam home and the museum provides a view into the life, culture and history of these diverse groups. It was very interesting and provided the perfect venue to escape the rain that had moved into Hanoi on our final day. A favorite for the kids, the museum included about a dozen full size "home" models showing how local people live in various parts of the country. After a morning of touring, we were all hungry, and Johnny recommended a great little place nearby. The restaurant, called KOTO (Know One, Teach One) is part of a hospitality training program developed by Jimmy Pham, a Vietnamese-Australian, giving disadvantaged youth the chance to learn and be successful in their lives. 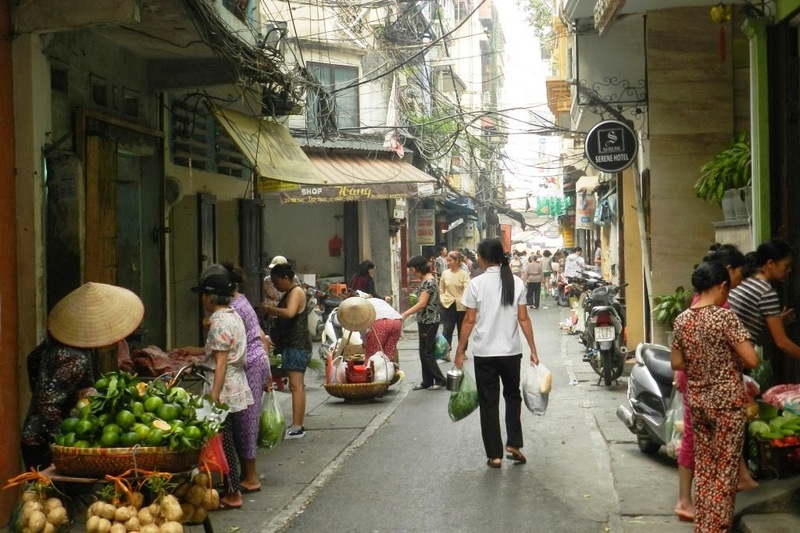 I highly recommend checking it out if you visit Hanoi. 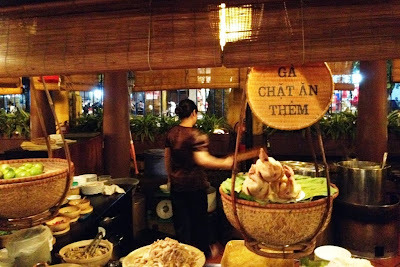 The food was delicious, the service was good, and by eating there you are supporting education and housing for Vietnamese teenagers in the hospitality industry. 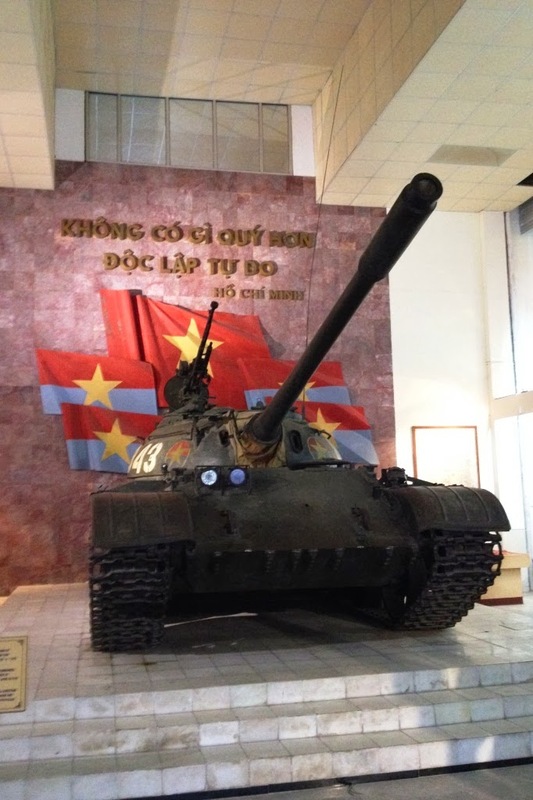 After lunch, we traveled to the "Victory Museum", which consists of historical accounts, artifacts and photographs from the early conflicts between Vietnam and its neighbors, (China, Thailand, etc. ), later conflicts with the French and ultimately the American War. Every aspect of the museum and Johnny's commentary were interesting. As would be expected, the museum was full of triumphant stories of bravery and superior military will and strategy. You'd find the corresponding alternative point of view in any US museum I'm sure. As we entered the area of the museum dedicated to the "American War", I immediately felt different than I did in the other portions of the museum. Photos of aircraft, tanks and jeeps that were successfully captured or destroyed by the Vietnamese were a blunt reminder of how many Americans were killed or severley injured in Vietnam. 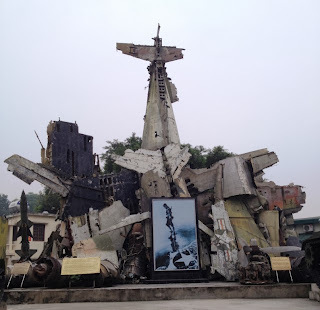 Just outside the museum, were more reminders, as dozens of aircraft (American and others) along with scrap pieces of many others that had been shot down during the war were on display. I was also quickly reminded of how many Vietnamese were killed and injured as well, when a man in his 70's approached and, in broken English, asked where I was from. When I told him I was American, he nodded, shook my hand, and proceeded to show me a large scar from his ear to the middle of his chest as he pointed to a picture of young Vietnamese soldiers. What do you say to that? I wasn't quite sure what to make of this, but it was obvious he was at the same time proud of his service to his country and saddened by the toll the war had on both his country and ours. For dinner, we decided to try Quan An Ngon, based on the recommendation of one of Jennifer's Wake Forest friends, Shannon. Quan An Ngon is a hawker center type restaurant that offers traditional Vietnamese street food without the worry of eating traditional Vietnamese street food. It was a great experience. We sat at a long communal table and were handed menus with hundreds of options to choose from. We tried a variety of Vietnamese style pork dumplings, fried prawn, fried chicken wings (for Cooper), Vietnamese noodles with chicken, and Pho with sliced beef. I would provide the Vietnamese names for these dishes (which sound far more exotic), but I don't remember them. 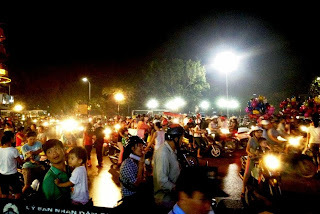 After dinner, we got one more thrill as we grabbed a cab and proceeded to drive directly into oncoming traffic - an appropriate good-bye to Hanoi. 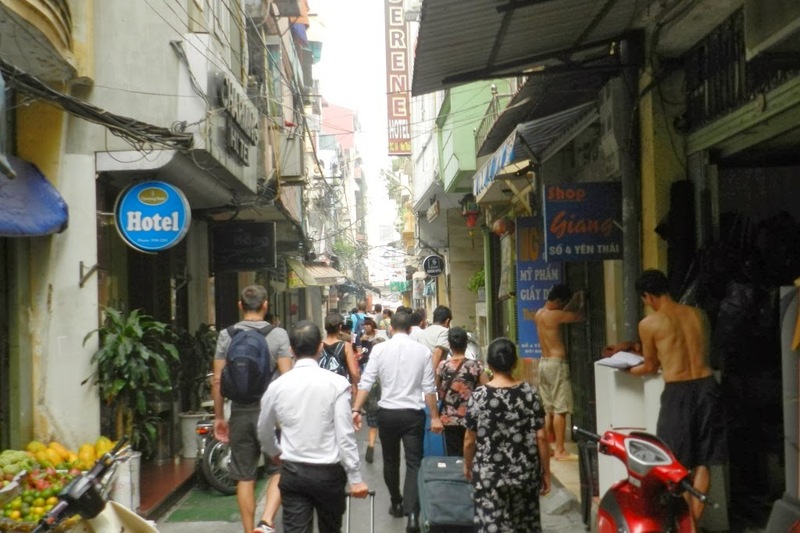 Dodging a bus, a few hundred mopeds and several women carrying baskets full of produce, we made it back to the hotel for our final hours in Hanoi. The next morning, we were greeted by nearly every one of the hotel staff as they wished us well and said goodbye. We took one last walk down the busy alley and the through the market just outside the hotel's front door and hopped aboard a small van to take us to the airport. A few hours later, it felt good to return "home" to Singapore, but I have to admit the safe, rule following drive home from the Changi airport seemed quite boring after the near death experiences of travelling through Hanoi! In all, the trip to Vietnam was amazing, eye-opening and unforgettable experience. 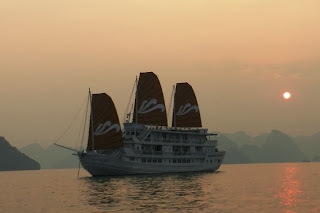 Before relocating to Singapore, I had never heard of Halong Bay, though it was recognized as a UNESCO World Heritage Site in 1994. (Honestly, I had never heard of UNESCO World Heritage Sites either.) Since arriving in Singapore, I have seen a ton of photos and have heard friends and co-workers talk about the beauty of the bay on numerous occasions. I had to see it for myself! 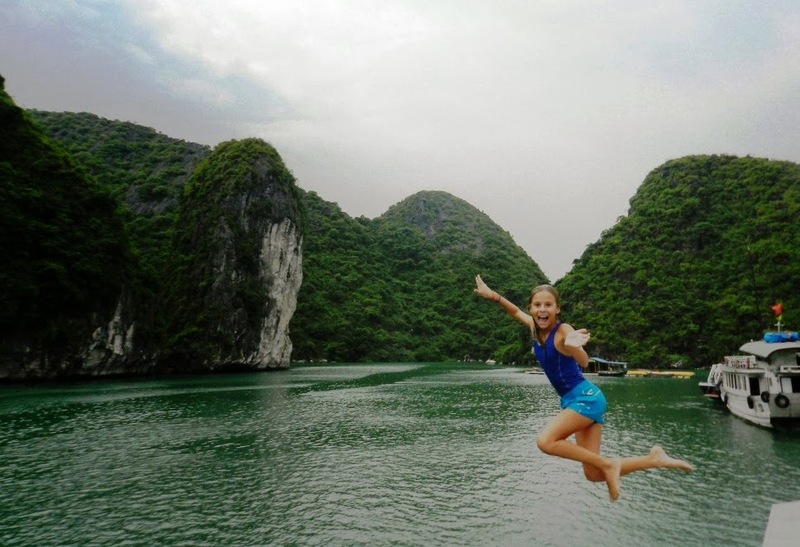 Literally translated to "Bay of the Descending Dragon", Halong Bay has historical roots dating back more than 16,000 years to the ancient Soi Nhu culture who lived on the fish and shellfish living in the bay. Local legend says that the bay was created by Gods to protect early Vietnamese cultures from attack and that a family of dragons lived in the bay to provide protection. Supposedly, these dragons still live in the bay...but uhh, I didn't see any. Still, the drive was very interesting. Like many of our trips through Southeast Asia, we got a brief glimpse into day-to-day life in Vietnam, albeit through the dusty windows of the van. During the drive we came across children on their way to school or headed home from it. 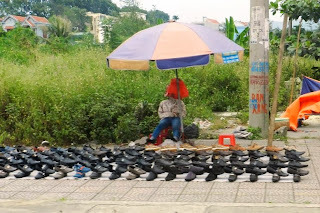 (schools are on a half day schedule) We saw a variety of roadside vendors selling everything from fresh bread and cold drinks, to the occasional shoe salesman with dozens of leather shoes neatly stacked on blankets long the road. 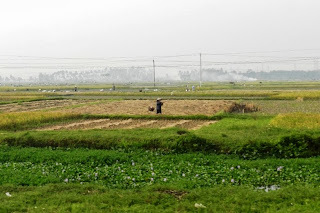 We passed hundreds of rice fields, all tended to by dozens of workers, most wearing the distinctive conical straw hat you'd expect to see in Vietnamese rice fields. 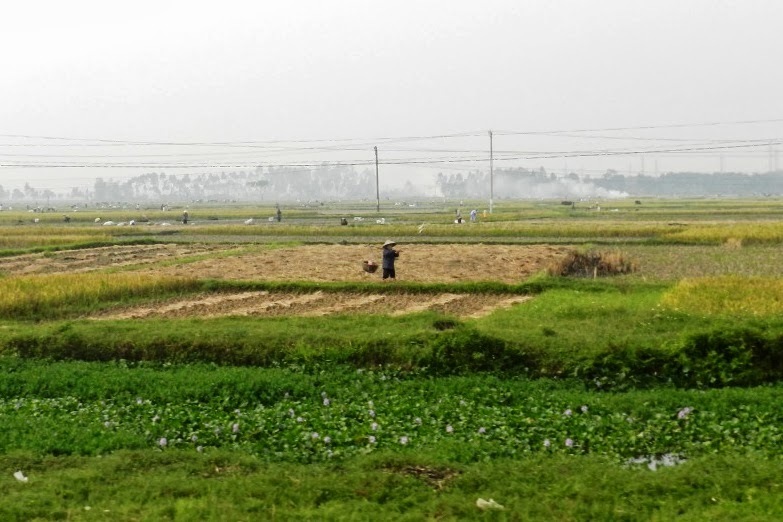 Similar to our experience in Cambodia, the fields were nearly all worked by hand with very little, if any, automation or machinery visible. 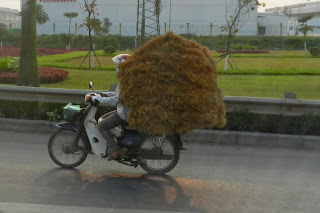 Among the more bizarre sights along the way were the fully-loaded motorbikes, carrying such enormously oversized loads that it seemed they could tip over at any time. We also sped by mopeds with two, three, sometimes even more passengers, often texting as they zig-zagged through traffic. 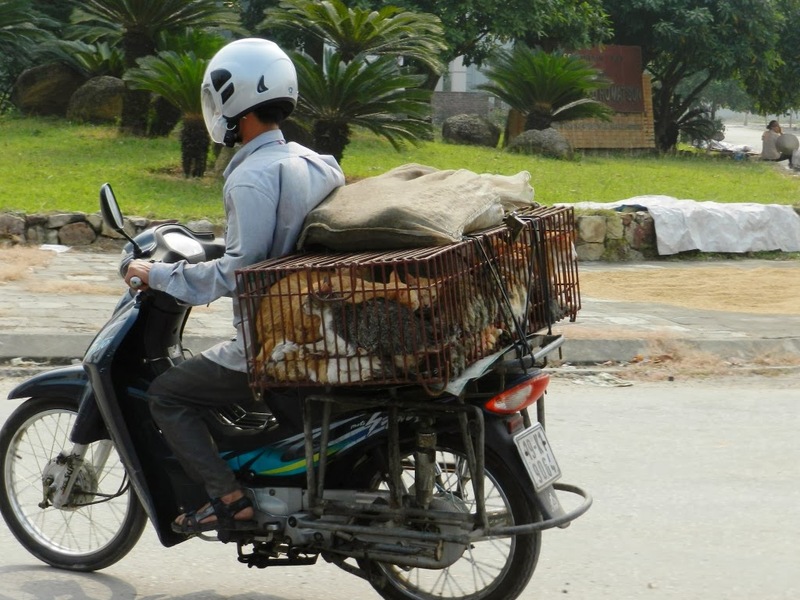 By far the oddest sight was the two mopeds that seemed to intentionally drive along side our van so we could all get a good look at the cage full of kittens they were delivering to...well, I don't know for sure where they were being delivered, but I have to assume it was more likely a kitchen than a pet store. Cooper agreed, proudly proclaiming (to Sophia's horror) they were soon to become 'Kit-Kats'. 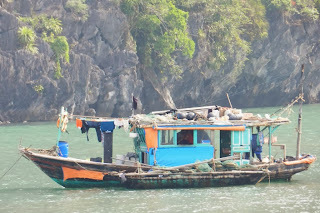 Look Closely - Basket and bag both full of "Kit-Kats"
Upon arriving at the Halong Bay Cruise Center, the surroundings changed dramatically. About a dozen large, freshly painted, white cruise ships sat on the water, with another two dozen, smaller "day trip" boats motoring in and out of the small port. Several cruise companies operated from the port, and each had their own reception areas complete with buffet lunches, drinks, comfy seating, and restrooms. Clearly the Bay produces a tremendous amount of tourist revenue, as the buildings that housed the cruise centers as well as the condos all around the port were new and modern. 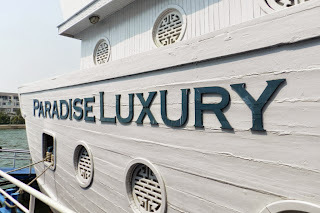 After about an hour of snacking and clearing my mind of the "kit-kats", we were invited to board our ship, Paradise Luxury 3. As we walked along the dock to the boarding ramp, it quickly became clear that not all of the cruise ships were as "freshly painted" as I had assumed they were from a few hundred feet away. 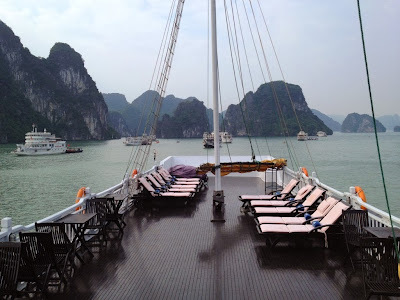 Luckily, Jennifer's TripAdvisor research came through and we were on board one of the most beautiful and well maintained ships on the Bay. The ship had four floors. 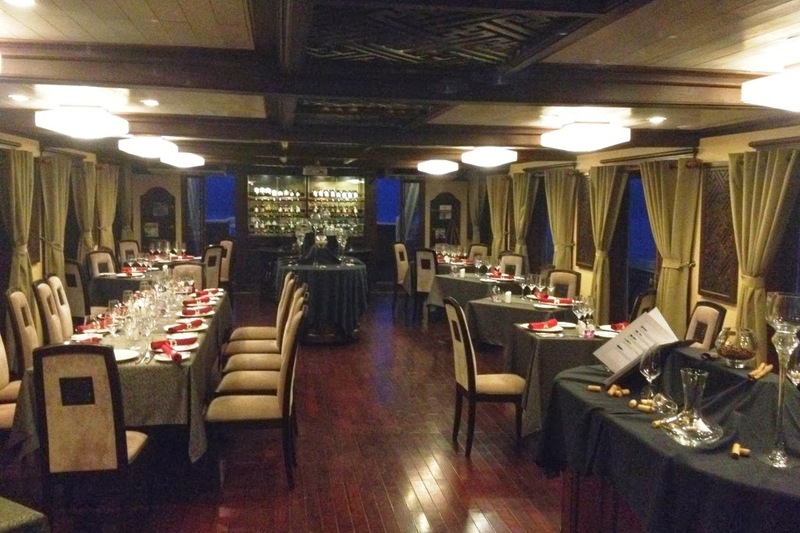 The bottom two each had about about 8 cabins, while the third and fourth levels contained the restaurant, bar, outdoor lounge, and a large sundeck. Though it would have given my parents a heart attack, we put Cooper and his friend Marcus in their own room on the first floor, Sophia and her friend Isla in a room on the second floor, and Jennifer and I enjoyed a "terrace suite" on the second floor as well. Though the rooms were not very large (even by cruise ship standards), they were comfortable, clean, and more than adequate for a two night cruise. As we pulled away from the dock, I went nuts taking pictures. The bay covers more than 1500 square kilometers and contains several thousand limestone islands, but you'd have thought the only rocks available to photograph were those about one km from the port. (I admit it, I went a little overboard at first with the photos.) 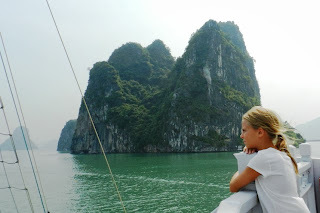 After about 20 minutes, we were surrounded by enormous limestone rocks, jutting up out of the water on all sides of the boat, each topped with lush greenery. It truly was beautiful, and with every minute (and 20-30 photos) we sailed deeper into the bay and into even more beautiful scenery. The water was exceptionally calm, so the ship sailed along easily, and steadily...which was good since Sophia doesn't like boats! 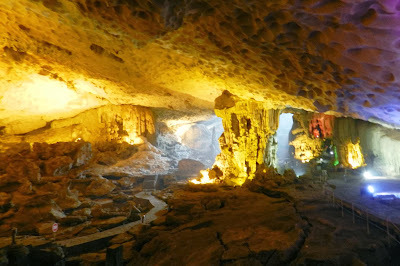 After about an hour of sailing, and a nice lunch, we reached our first "excursion point", the Hang Sung Sot Cave. We hopped onto the small pontoon boat that was tagging along with the ship, and motored over to a vegetation covered island. From here, we climbed up about a hundred steps to the entrance to the Hang Sun Sot cave, or "Cave of Surprises". Honestly, it was a surprise, as the cave was massive and seemed to go on forever. Guides pointed out animal-shaped rock formations and the effects of high water levels that used to fill the cave, but in general I was simply amazed at the sheer size of the place. Our next stop was Ti Top Island, where we had the option of swimming, kayaking, or walking to the summit, which offered an amazing view of the bay. Jennifer and the kids relaxed on the beach while I made the climb. (Jennifer: To get 2,004 more pictures.) 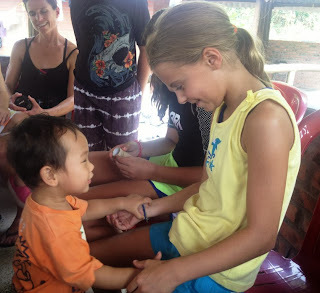 When I returned, the kids were running, swimming, and laughing with their friends, and I was glad Jennifer had a cold Bia Ha Noi (local beer) waiting for me. 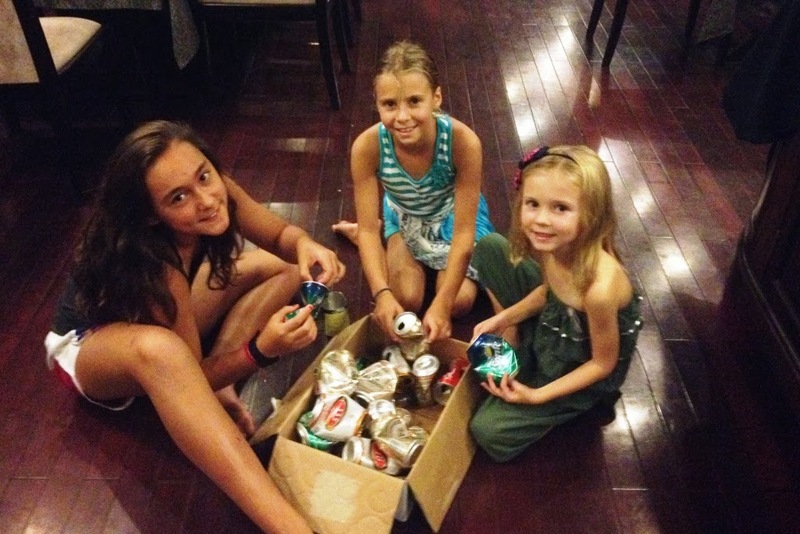 In addition, Sophia had been collecting aluminium can tabs for weeks, preparing to donate them to a prosthetics factory in Thailand (more on that in March when she goes on the school field trip)...but this activity kept the girls busy during the evening on PL3, posting signs on cabin doors and coordinating with the bar to save and collect as many tabs as possible during our cruise. For the adults, we were all glad to relax outside on deck or in the dining room with a cold drink...besides, we wanted to do our part to provide Sophia with can tabs. Sodas, beer, wine, etc. were all available from the PL3 bar, but I also enjoyed purchasing a couple cans from the local women who would paddle by with small wooden boats selling food, drinks and souvenirs. There was something fun about ordering from the items displayed on the deck of their tiny boats, and having your items passed to you at the end of a 20 foot fishing net pole. Day two, another excursion...this time, we were off for the entire day. 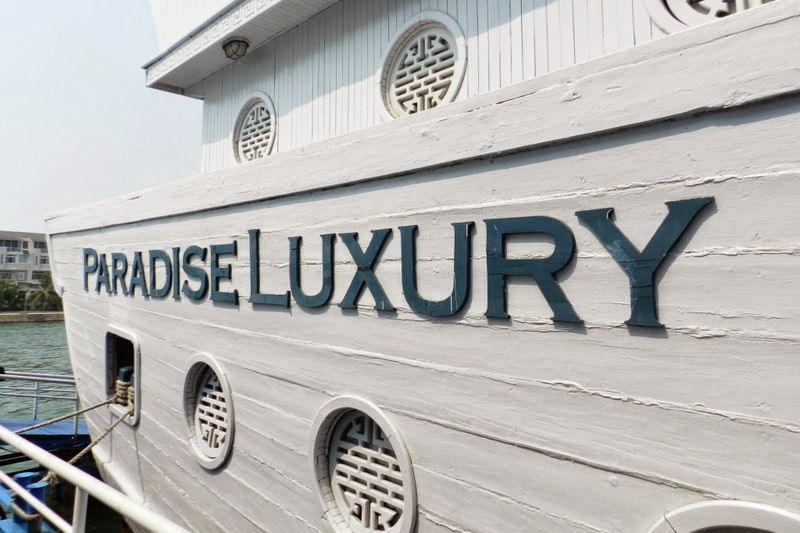 We left the Paradise Luxury 3 (PL3) and met up with passengers from the PL1, PL2 and PL Peak for a full-day excursion on a smaller boat (called the "day boat"). 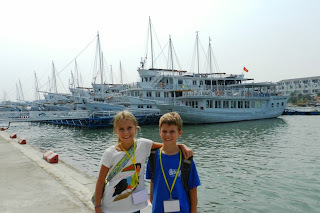 Our first destination was Cat Ba, the largest island in the bay. The day boat had a dining room on the first floor, bathrooms, and a large sun deck with shaded areas and comfy seating and was more maneuverable to allow us to cruise into parts of the bay the PL3 wouldn't have gone. Upon reaching Cat Ba island, we were told we could travel by bicycle or motorbike about 5 km inland to a small village. Cooper, and just about every other kid, was all about the motorbike option... Sophia, not so much. After learning that the ride was hilly and relatively treacherous, we for some unknown reason decided that balancing ourselves on the back of a moped driven by a Vietnamese villager was the safer option. Oh, did I mention I didn't have a helmet? It was quite a ride to say the least, but we arrived at the small village in one piece and took a walking tour to see how people live on this remote island. The highlight of the island visit was easily our encounter with a young Vietnamese boy (maybe 18 months old) who wobbled back and forth across a small bridge to give high fives and grab onto the kids in our group. He was really cute and the kids had a good laugh as he ran back and forth, smiling and laughing each time he approached us. After a cold drink (we saved the can tabs) and a few more high fives, we hopped on board our "chaffeured" mopeds and sped back to the awaiting boat. Again, we all made it back in one piece, but I did leave with a pretty sweet burn from our moped's muffler. I'm fairly sure it's going to be a permanent reminder of this adventure. Back on board the boat, we sat for the most enormous lunch I've ever seen. 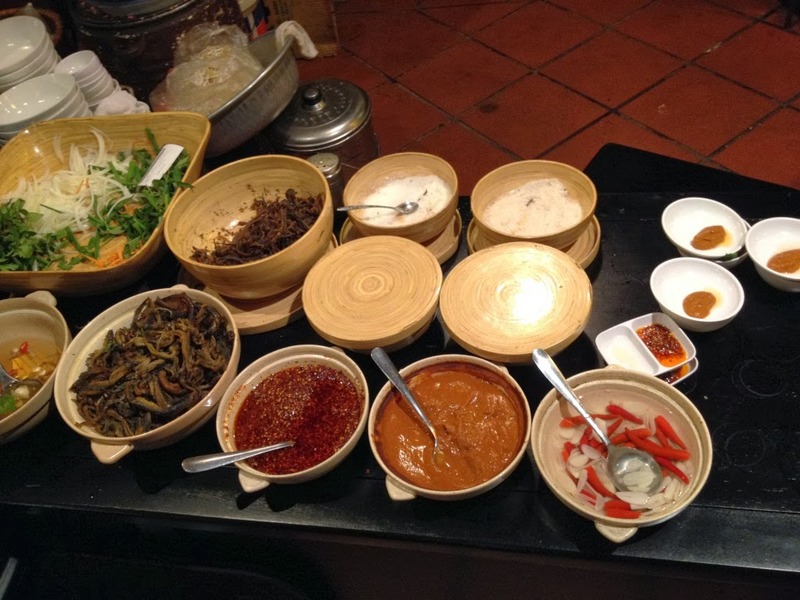 Spring rolls, noodles, geoduck, curry chicken, beef wrapped in greens, prawns, asparagus, salads...it was never ending! Our group of 12 was full, and our table was still overloaded with half-full serving dishes. Once we reached our next stop, however, we were glad we hadn't overindulged. We stopped in a quiet little cove, surrounded by a number of islands. From here we had the option of swimming, kayaking, jumping to the bay from the roof or relaxing and taking advantage of a foot massage. 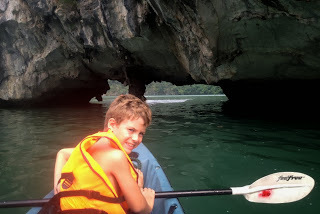 While Jennifer opted for the latter, Cooper and I ventured out on a kayak to explore the bay and squeeze through a few of the nearby caves. I'm glad we did, as we really got a different appreciation for the bay, the size of the rocks and how the area is ever-changing due to tides and erosion. The caves we explored were caused by continuous erosion from the water lightly lapping against the limestone. 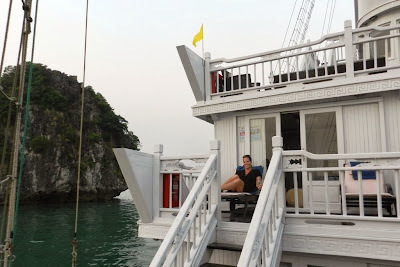 When we got back on board the boat, it was time to jump from the top deck into the bay. 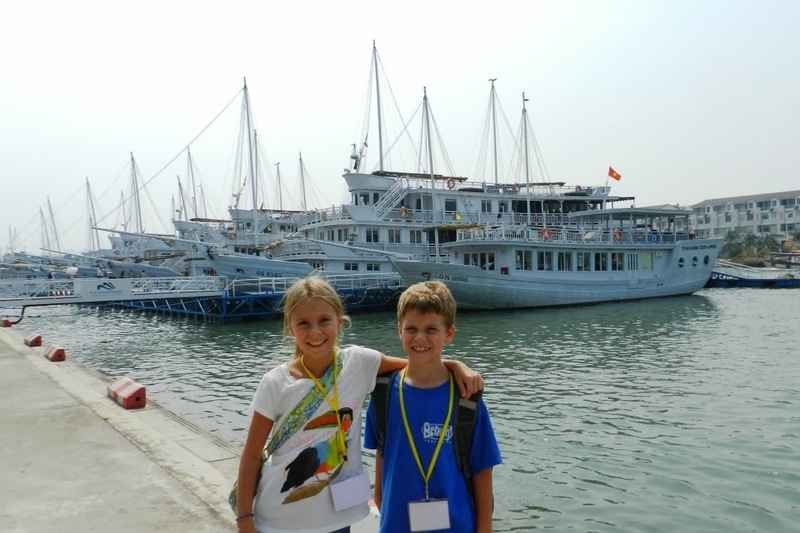 Cooper and Sophia had both looked forward to this since we boarded PL3. 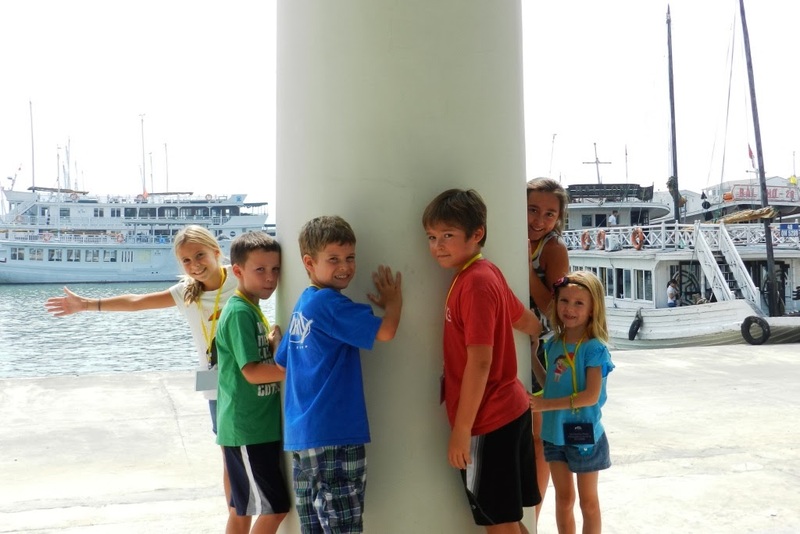 Once they started, it was difficult to get them to stop, and they (and the other kids) jumped over and over from the top of the boat. 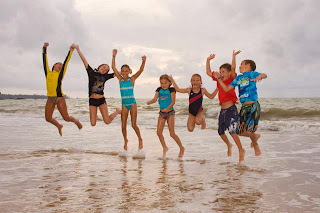 Several of the adult passengers (myself included) did the same, but the kids clearly took top prize for the most creative and sheer number of jumps. As the day wore on, we headed back to the PL3. On board, we enjoyed another dinner, a fried spring roll cooking class and a "drinking class" during which the adults learned how to toast in Vietnamese while drinking local rice wine. Soon, "Mot, Hai, Ba, Yo!" 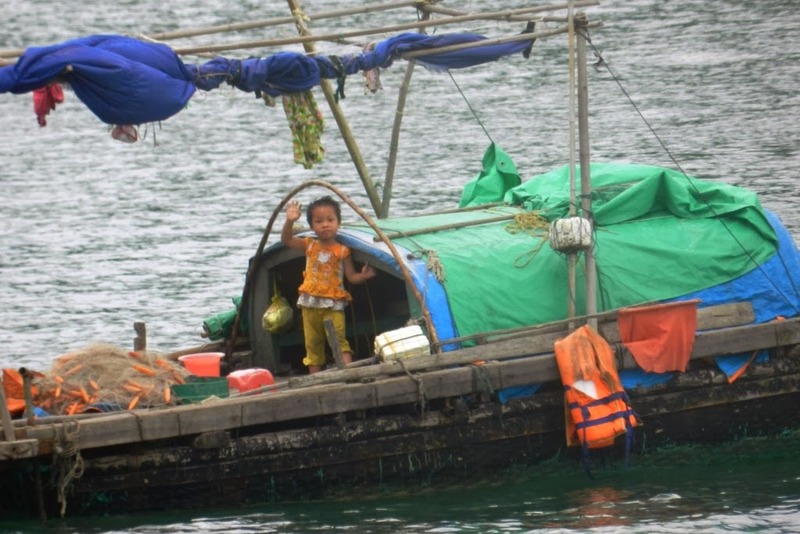 (cheers in Vietnamese) could be heard from several boats in the bay, as the guests on other boats nearby took part in a similar toast on their sun decks. After our second night on board, we enjoyed an early breakfast and sailed back toward the cruise center. Another excursion was available early in the morning, but our group all decided to relax and take in the scenery from the comfort of the PL3 instead. 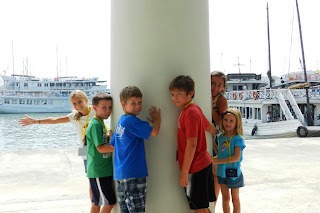 As we sailed to the dock and the cruise center, the wind was picking up and the temperature dropped. The bay wasn't quite as calm, and we all realized we were lucky to get three days of pleasant weather...knowing the people about to board the PL3 were likely to get some rain, wind, and cloudy skies for their journey. So with the boys in bed, and us about to embark on a mother-daughter service trip to Cambodia, we had a nice chat. We decided on one concrete thing - it is way better to have to leave all these people than it would be to have never met them in the first place. I had stated that on a previous post when a great friend moved home to the US and it's really hitting home now for us. But what I really wanted to touch on in this post is the possibility of YOU becoming an expat somewhere. Because you know what, this just didn't fall into our laps. We ASKED for it. You can too. So many of you say you wish you could do what we're doing. 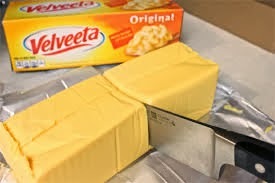 Others I know say they would never do it. I get the first half, and I hope to change the minds of the other half. Here is our story. In October of 2011, I mentioned to Jason that I would love to go overseas. What is so funny, is that a major part of why I wanted to was because of my high school friend, Amy Harrison Thogmartin. She was my best friend sophomore/junior year and her father (love that man!) was transferred to Singapore fall of junior year. So how many of you are now thinking, "I would never move my kids in high school!" 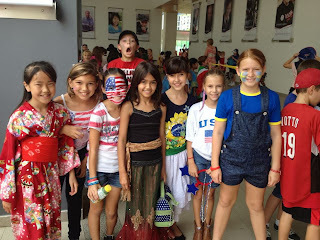 Well you know what, she LOVED it and still has a great network of her Singapore American School Friends. And this was before that whole crazy thing called cell phones and internet. This is what has always fascinated me about moving. Most people think it is a detriment to the kids. In MY experience, it was always a good thing. 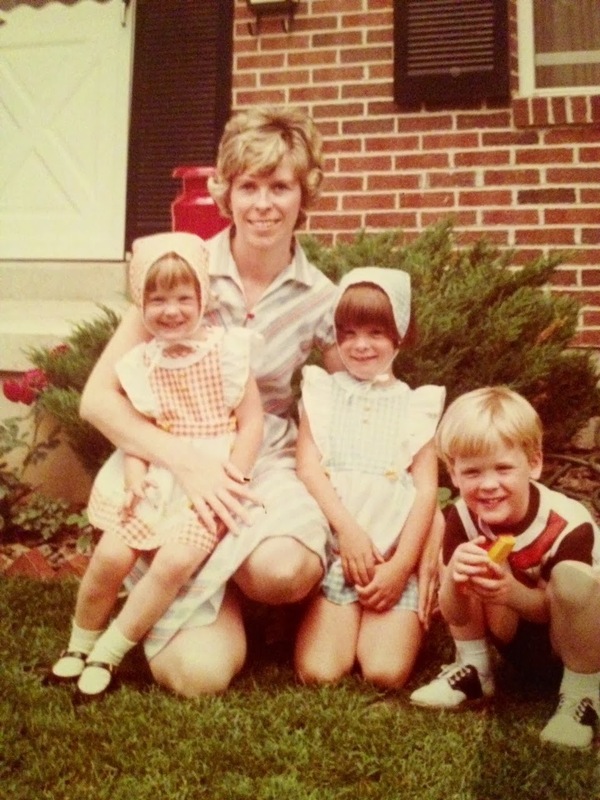 Because of my father's chosen field, human resources, we moved quite a bit when I was a child. Eight times before I got to settle into high school to be exact. Now, I never had to move in high school, unlike Amy, so I cannot personally speak to that, but the other moves were not a problem for me. I know that my brother and sister (twins) maybe didn't like it as much as I did, but I adjusted well each time and I am eternally grateful for what I consider to be a byproduct of that - an ability to easily meet people. But we're talking just moving up and down the east coast of the US - nothing like Singapore. So back to October of 2011 - I'm already ready to go pretty much anywhere. Jason has moved once - a few miles - in his entire life. I was pretty surprised he was totally on board. He also never had a pet before we met, and our dog is probably more important to him than I am - so go figure. Within a week, he was discussing a possible move to Shanghai with someone. Now I am very liberal in where I'll go, and I still think I would have gone, but at the time Sophia had just gotten over a horrible bout of pneumonia, and I was very nervous over the air quality standards. I remember sitting in our bed at night talking and saying, "If it was just Singapore, we'd say yes in a second!" About a week or two later, Jason was approached about a job in Singapore and had an interview with his current boss, who happened to be in New York. They had been searching for someone with Jason's qualifications for a while and had no luck, so they were turning the search worldwide. They clicked and it was soon a done deal. 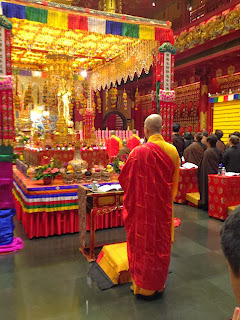 By January, we were in Singapore on our "look see visit". By the end of the month, Jason had a plane ticket out of the US and our house was on the market. I have to tell you all, it has been the most AMAZING experience of my life. We've been to the Philippines, Cambodia, Australia, Thailand, Malaysia, Vietnam, Sri Lanka and Indonesia in less than 18 months. We've seen villages where people sleep on wood slats and have no running water to areas ravaged by tsunamis to the gorgeous Sydney Opera House. My children have made friends all over the world. 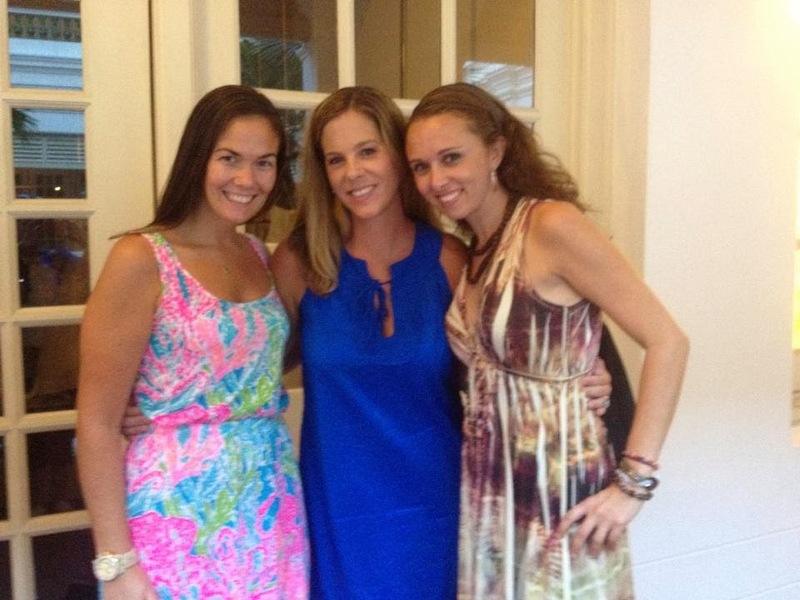 Just last week I was talking to the mother of Sophia's best friend. 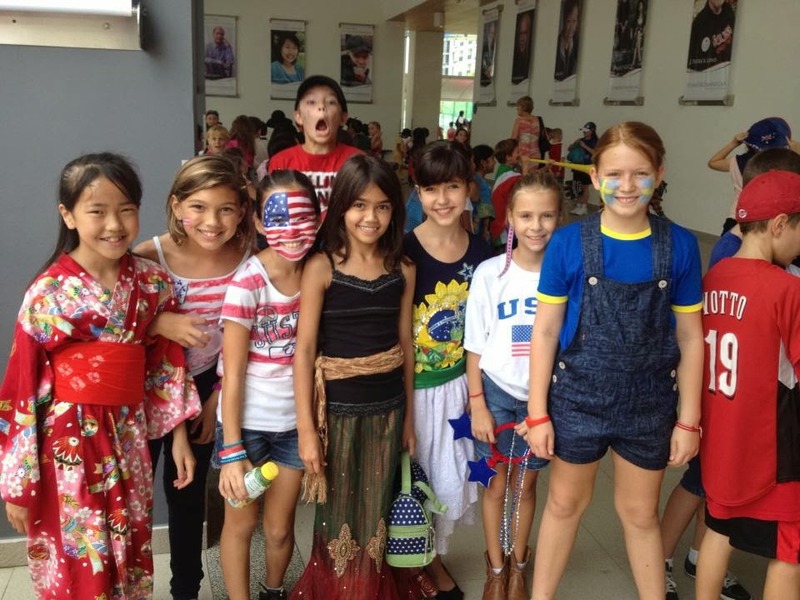 They will most likely move to Sweden after Singapore, and she (Liisa) has already asked if it would be possible for Sophia to be an exchange student for a year in high school. Great friends just left to go back to Texas and I'm about to book a plane ticket for Sophia to go visit her friend this summer. I just cannot describe how life-changing a decision like this can be. There is nothing wrong with living in the same town your whole life (whole set of different positives) but if you want or are ever offered the chance to do something like this, JUST DO IT. It won't always be perfect...what in life is?? But my friend, Jennifer Krouse Tynes, who is currently on a way more difficult expat assignment in Bologna, Italy, would agree with me. I see another expat friend from high school, Amy Chase Erickson, snowed in for eight months a year (I am exaggerating!) in Finland, but she is so happy! It is still worth its weight in gold. Your kids will gain so much in culture and confidence. 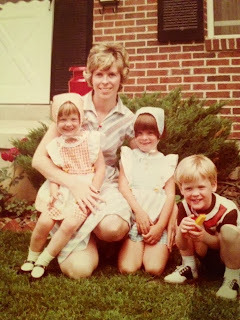 Not only am I a different person now, but my children are markedly different little people. They have an awareness of things that I never had as a child, and I marvel at the adults they will become. So here I am, less than five months from coming home to the US. I cannot wait to see my friends and family, but I am sick about leaving the people and places here. I really get how the long-term people here don't want to get too attached to us short-term people, because I'm practically in tears on a daily basis and I'm not even going yet. Luckily, we have plans to attend the wedding of two teachers at the school here in June in Georgia, so we can count on seeing a few familiar faces only three months after our return (thanks Maureen and Andrew!!). It really helps. Please do your family a service - if you ever have an opportunity to go overseas, no matter how young or old your children are - DO IT. They will thank you, be it sooner or later. 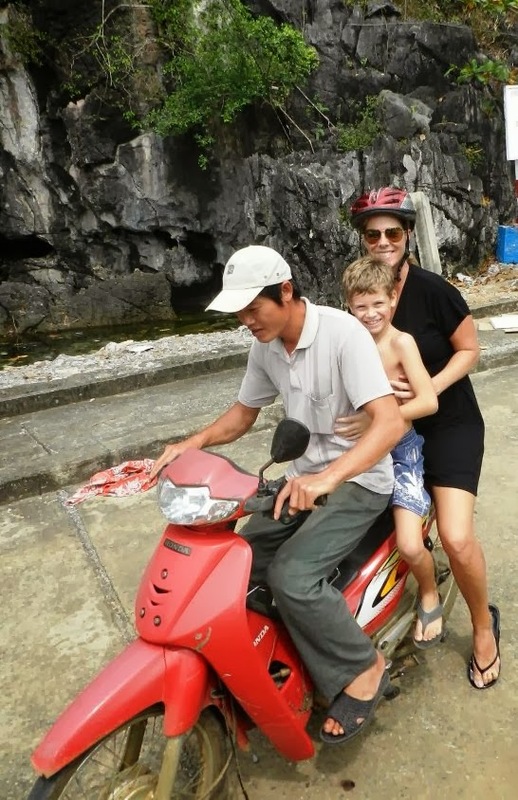 If you had asked me two years ago, Vietnam would easily have been among the least likely places I’d travel for a family vacation. 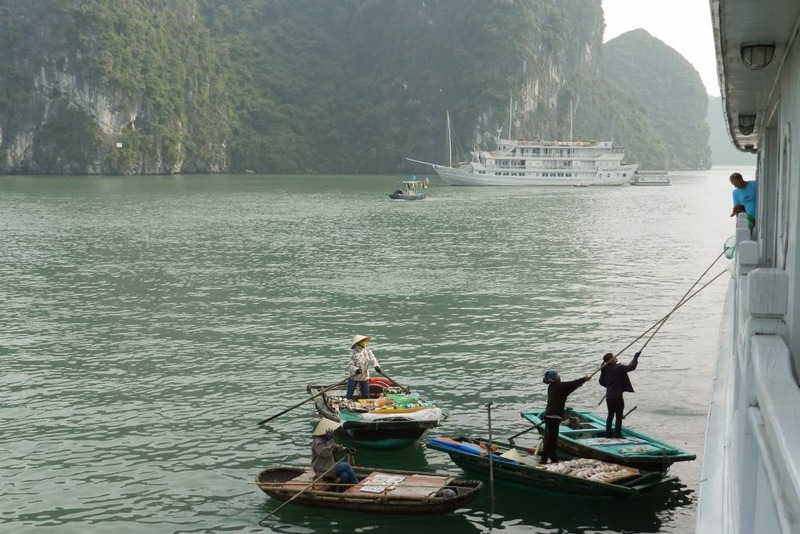 In part, due to the historic relationship between the Americans and Vietnamese, but mostly because it’s really far from the US and I never imagined it offered anything worth travelling that far to enjoy. 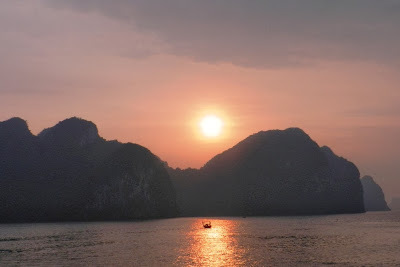 We recently returned from a five day visit in Hanoi and Halong Bay, and I now realize how shortsighted and narrow minded I was. 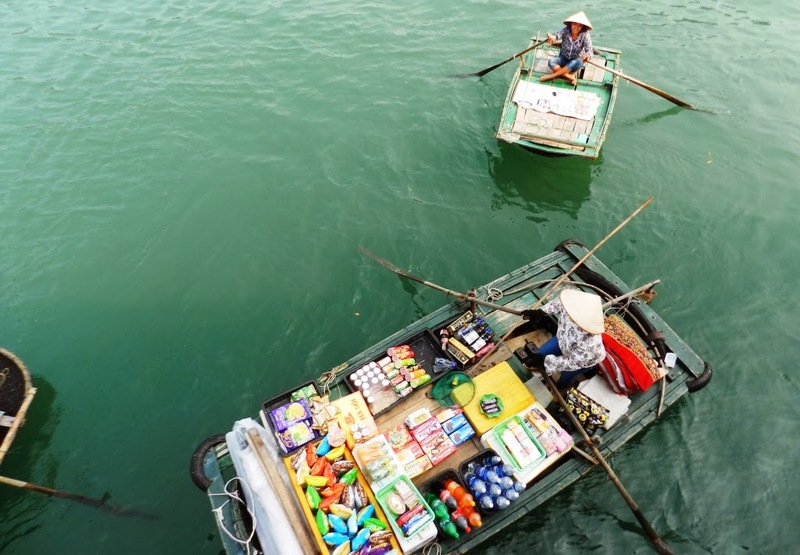 Vietnam is the eastern most country on the Indochina Peninsula and is home to more than 90 Million residents (making it the 13th most populated country in the world.) It's about 1/30th the size of the US, with about 1/3 of the population. Do the math, it's pretty crowded. Hanoi is the second largest city in Vietnam and is over 1000 years old. 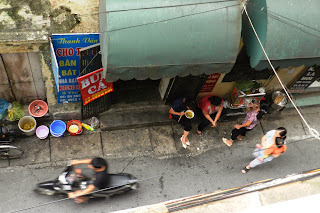 It's home to about 6 million people, and by my account, every one of those people travels by bicycle or moped just outside the front door of the hotel where we stayed, on a daily basis. Honestly, I’ve never seen so many people traveling in so many different directions at the same time! 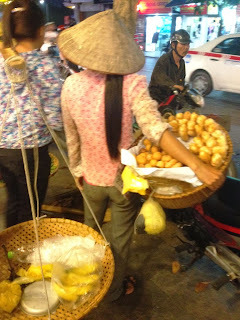 But that seemingly chaotic energy was one of the things that I really enjoyed about Hanoi. 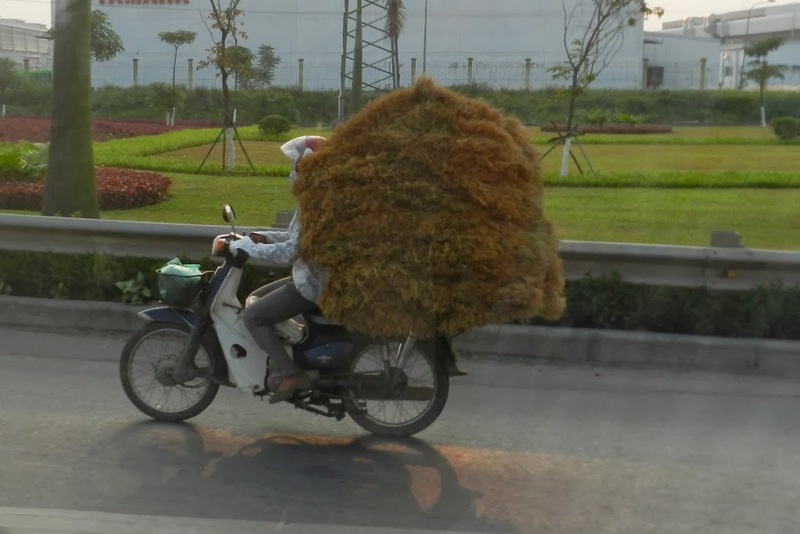 After experiencing insane driving in places like Indonesia, Sri Lanka and India, I thought I had seen it all…but Hanoi somehow took it to a new level. Cars, buses, bicycles, mopeds etc. all managed to travel the streets of Hanoi, dodging each other, and people on foot, with ease. Though, admittedly, very few actually appeared to follow a common set of rules. 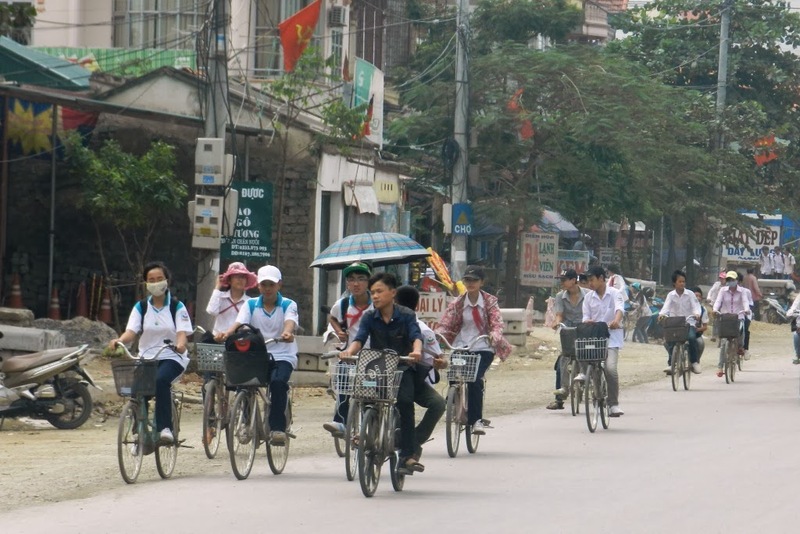 We learned late in our visit, “everyone respects everyone else and so you move slowly, maintain your speed and direction and everyone adjusts to avoid hitting each other”... well, at least that's what our guide, Johnny, told us on our final day in Hanoi. But, he also told us the reason people wear face masks as they drive all over town is to keep from getting a tan....not because the city has a slight pollution problem. So, take Johnny's guidance with a grain of salt. 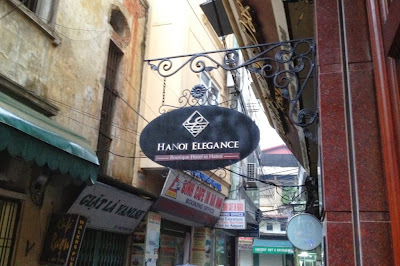 Unaware of the appropriate traffic “etiquette”, we still managed to successfully navigate and explore Hanoi without incident. On the evening of our arrival, our group of 12 (Ludts, Bergstroms and Burnetts) walked the city to find a good place for dinner. The tallest of our crew, Scott, led the way (though we all stood a head taller than most Hanoi residents) to The Gourmet Corner where we enjoyed dinner with a view over the entire city. Dinner was quite good, especially with a menu that catered to the adults’ desire for local cuisine and the kids’ desire for chicken nuggets and pasta. While I enjoyed saying the name of Jennifer's dish (Bun Bo Nam Bo - go ahead and say it...it's fun to say, right? ), I preferred the taste of mine (Bo Ong Vau) - or grilled bamboo beef. After dinner, we spent a short time exploring the night market. It consisted of many of the same "treasures" we've seen in other parts of Southeast Asia, including t-shirts, hats, national flags, and every imaginable, cheap, breakable toy your kids could ever want. There were a number of interesting handmade items, but we found that the selection and quality in the surrounding stores was much better. 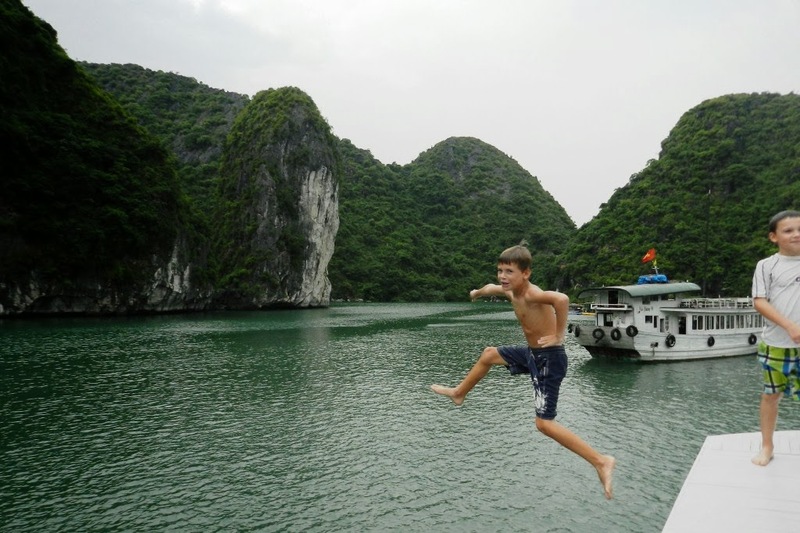 Besides, we were all pretty beat from a day of travel and headed back to our hotel, The Elegance Ruby Hotel, to put the kids in bed and prepare for an early morning, four-hour car ride to Halong Bay. As usual, we selected the Elegance Ruby Hotel because of its top rating on Trip Advisor. After a few short hours there, we understood fully why previous guests raved about it. 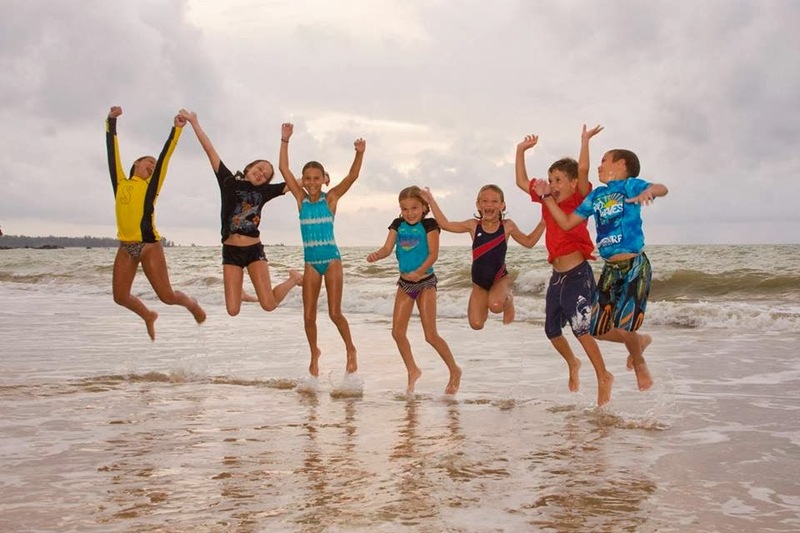 The staff was exceedingly friendly, welcoming and eager to provide anything we needed. We were met with a “good morning” upon reaching the tiny lobby every day, and at breakfast the staff was attentive and accommodating. Cooper loved the attention to detail when he ordered his daily pancakes - with both syrup and chocolate. Sophia loved the multiple juice options and fresh croissants. The front desk staff also offered to track down stamps and to mail postcards back to friends and family in the US, probably because directions to the post office would have been impossible. They were also very helpful in identifying an appropriate guide (Johnny) to show us around the city on our final day in Hanoi. 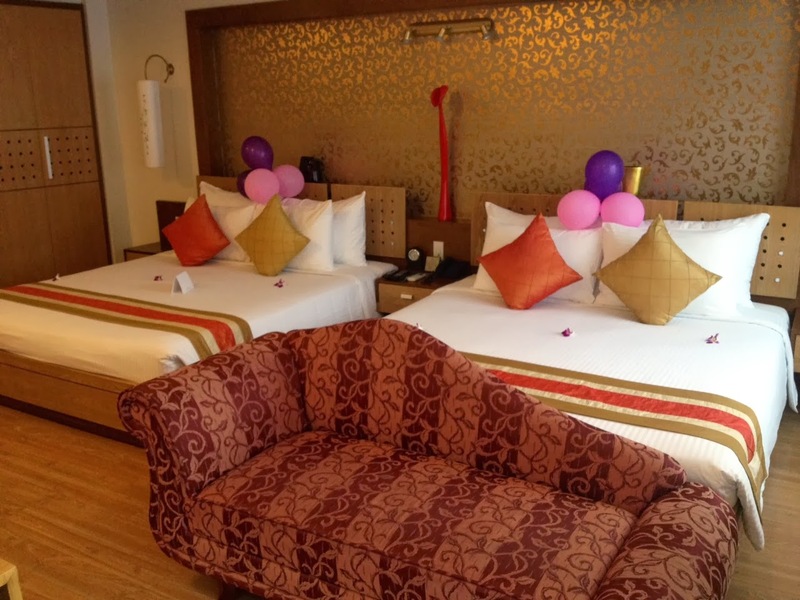 The rooms were very clean and spacious and the beds were very comfortable (which I understand is rare in Hanoi hotels). The kids loved the balloons that sat on each bed when we arrived and the hotel had a small living space on the second floor where we spent two nights enjoying a cocktail and game of cards. Though the staff was reluctant to join us in our card game (when we asked) they were quick to bring a bucket of ice to keep our beer and wine cold. 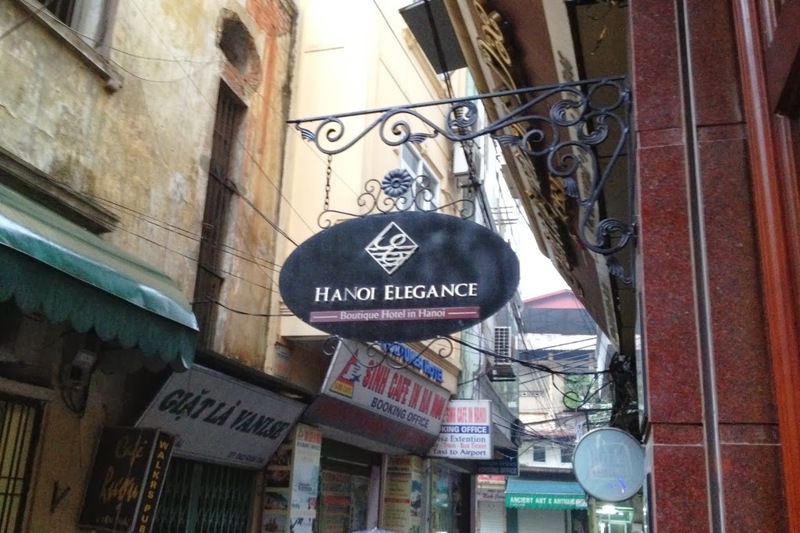 Without question, I’d highly recommend the Elegance Ruby Hotel to anyone visiting Hanoi. 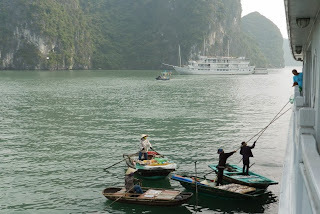 In the morning, we all enjoyed our breakfast, packed up our bags and prepared for the long drive to Halong Bay. But before we left, we took a few minutes to explore the busy alleyway just outside the door of the hotel. 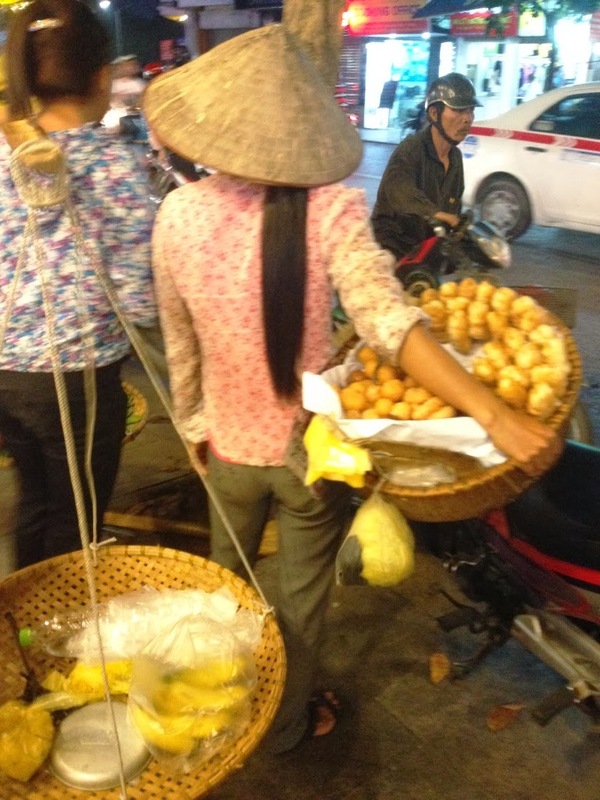 This was truly one of my favorite parts of our visit to Hanoi. The evening before, this alley was bustling with small shops, local street food and the regular flow of mopeds and bicycles zipping by. 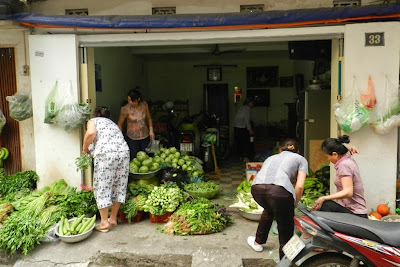 In the morning, it transformed into a thriving market with fresh produce sold right on the street, off the back of a moped, and from the occasional basket carried over the shoulders of tiny women walking the street. In addition, chicken, meat and seafood of all (literally ALL) varieties was being chopped, ground and wrapped. In some instances, the market was an extension of the existing clothing or shoe store. 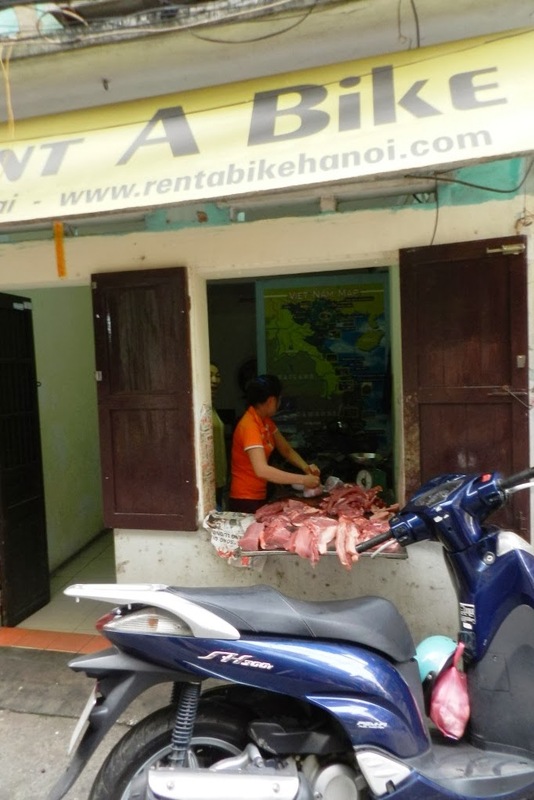 In one case, meat was being chopped at the counter of the “Rent a Bike” kiosk. In nearly all cases, this market existed directly outside the doors of people’s homes, who lived either above or behind the shops they worked at. It was truly amazing to witness. Rent a Bike....Get a Free Kilo of Beef?? After we all had a good look around, it was time to climb into our pre-arranged transportation and settle in for the four hour drive. The next part of this adventure was about to begin...next stop, Halong Bay!